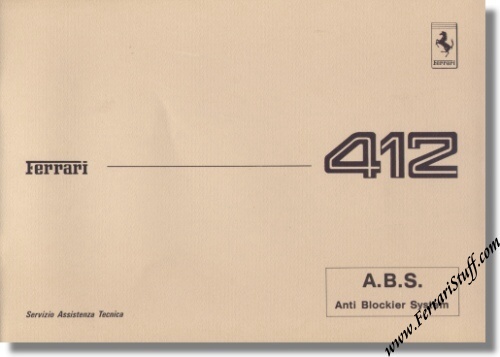 Ferrari factory original 1986 Ferrari 412 ABS Service Manual. Factory Original, issued by the Assistenza Tecnica department. This Ferrari Workshop Manual contains 29 pages, including many drawings & diagrams, dealing with the functionality of the ABS system, the theory, the components, maintenance and wiring diagram. Languages: Italian + English + French + German. Ferrari Print Number 461/86, issued in 1986, printed by Graphotechnica in Maranello, Italy. If you own a 412, this book should be in your library of course.